Random Felines: Where did the extra hour go??? Where did the extra hour go??? Then there is Chiclet. She is doing VERY much better and is anxious to get out of the bathroom. We can't seem to get anyone to tell us if she was spayed when she had her surgery last week, so we aren't sure if she can go to the adoption event on Saturday as well. Mom was a little annoyed this morning when she called the clinic that did the surgery and got voicemail that said they would call her back in 3-5 business days. WHAT???? How do you run a business like that?? We thought we would take a look back at how far the kittens have come. The first pic was taken when they got to the house on Sept. 19. The second pic was taken 11-4 (thought Utah is missing from that one). Wow -- those kitties have really grown! It sounds like your mama is doing a great job keeping everyone healthy, but what is up with that stupid answering machine??? I would feel frustrated too. 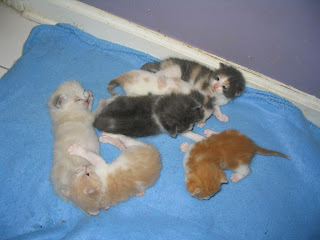 I hope whoever adopts Bug and the kittens will keep you updated. Wasn't a friend of yours interested in Bug? A friend of a friend was supposed to be interested in Bug. However, I guess it was a freak accident that killed her previous cat and she just isn't over it enough to move forward with another cat just yet. I was hoping to keep her "in the family" but I will be happy if she can have a family of her own. Though I will miss her a LOT! 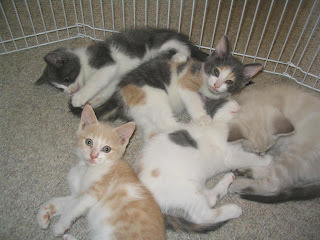 what fun it is watchin' these babies grow up--thank you fur sharin' wif us. we're not sure we would do well wif alla them swarmin' around alla time, but then it'd be nice to have extra cuddle buddies, too. we will purr that that all find specially nice homes, just like yours! !